The award-winning �card crafting� game Mystic Vale will receive its third expansion set on October 26 with the release of the Mystic Vale: Mana Storm Expansion. Mana Storm introduces a new element to the game in the form of �Amulets,� which offer more variety than the regular mana tokens from the base game, as each Amulet has its own unique effects. The expansion also adds more variety to the game with 48 new advancement cards and 18 new vale cards, as well as eight new leader cards. 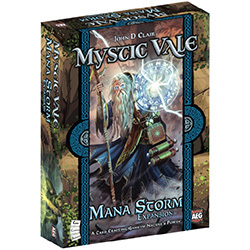 Preorder Mystic Vale: Mana Storm Expansion (AEG7004) now!